To understand the value of Libyan geopolitics requires more than a few years of close study as its relationship with the U.S. predates the formation of our government, military and presidential office. Then as now the world turned upon revenues which necessarily flowed through the vast lanes of Mediterranean basin. In a world where that region has lost much of its past strategic value its potential and very real economic value Libya still raises the American political ire. According to the CIA factbook: "The Libyan economy depends primarily upon revenues from the oil sector, which contribute about 95% of export earnings, 25% of GDP, and 80% of government revenue. The American tradition of maintaining global stability is almost as old as its military itself. American interests in this region are over 2 centuries old stretching back to the first Presidential administration of George Washington and VP John Adams. The threat of piracy while common at the time was so significant that a navy was conscripted by the Jefferson administration for the purpose of confronting the Pirates off the coast of Tripoli. Historically, the region that is now called Libya posed a CLEAR AND PRESENT DANGER to American economic interests. Thomas Jefferson whose own party was "anti-navy" and sought "westward expansion" rather than "Old World entanglements", upon taking office in 1801 declared war on belligerents in the region and sent against them American's newly minted Navy (officially commissioned in 1794). While the both Washington and Jefferson were often quoted as being against such foreign adventures even in its infancy, U.S. foreign policy anticipated the need to protect U.S. interests in foreign lands. While the stakes seem to be much higher today, the motives have hardly changed. The Obama Administration plays a shell game of semantics, Americans understand quite well that another conflict is inevitable as 6 Naval Ships now occupy the region. The first U.S. ground war ever fought on foreign territory was during the Second Barbary war at Tripoli, where a detachment of U.S. Marines aided in the transfer of the throne, ensuring that "our guy" became king. Ultimately invasion and regime change were better answers than making tribute to Pirates, in exchange for protection of Mediterranean/Atlantic ocean commerce. Thus, much like our recent "war on terror", the goal of extending American military might into the heart of Africa was to ensure regional stability by primarily by rooting out Pirates, the "terrorists" of their time. Second to that was to leave the country with a regime friendly to U.S. interests. If challenged to sum up with one word what Libya means to American interests today I would suggest that its political position is important in the middle eastern puzzle of so called "regional stability". 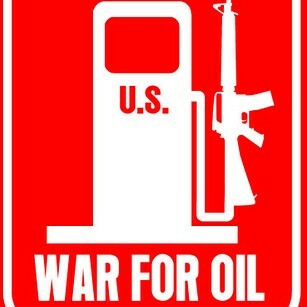 More importantly however it's vast resources of oil present an irresistible and easy target. While the geopolitical importance of Libya to U.S. interests goes back as far as the 19th century its strategic value has INCREASED dramatically with time. Once an ally to the U.S. in the past Qaddafi has supported our causes, in spite of his being reviled in public by successive administrations. Ronald Regan once referred to him as "the mad dog of the middle east", however as history shows this did not preclude his value to the United States, and so he remained, outlasting a slew of contemporaries such as Saddam Hussein, Yassar Arafat, Idi Amin, and Slobodan Milosovic, to name a few. Educated in the West Qaddafi has served U.S. and European interests for decades. This upstart Col. whose anti-marxist rhetoric made him appealing in the late 60's, Qaddafi purportedly became a neophyte of the CIA and was aided in the overthrow of then King Idris. Armed with this pedigree and his own mixture of charismatic leadership he became valuable ally in the Cold War, however, upon seizing power Qaddafi targeted the West with vitriol and subversion ultimately turning Libya into a haven for international terrorism colloquially referred to as: Blowback. Qaddafi, a reputed sponsor of international terrorism, and dictator accused of crimes against humanity has continued to shake hands with world politicians, operate global industries, and personally rake in billions of dollars in oil profits over the heads his impoverished people. Having had his countries and personal assets seized and then returned (even after proof of his and U.S. involvement in the Lockerbie bombing), he is essentially a "teflon dictator". Today however America once again finds itself confronted with the specter of footing the bill to bring "stability" to one of the worlds most vital regions. Forgetting the lessons of Iraq, Afghanistan and Vietnam America has become the worlds nation builder despite its own internal economic, social and political decay. Thus our military leaders , speaking with such conviction about our military "successes" offer rosy assessments on the Afghan and Iraqi conflicts hurriedly make contingency plans for a THIRD front, on a THIRD continent, with old friend turned foe: Col. Muammar Qaddafi. Great wars are often begun with good intentions, and while most commentators would suggest that a U.S. backed removal of the Libyan strongman would not be ideal, ultimately we would probably "win" (if one defined that by ousting a dictator) and replacing him with a "democratic" styled government. To borrow a phrase from Charlie Sheen we are in the words of our leaders "winning" in Iraq, "winning" in Afghanistan, "winning" in Pakistan, and we may "win" in Libya: but at what cost?? As an American I am troubled by what I see in the political arena domestically and abroad. Our priorities are out of wack. Henry Kissinger once wrote in a chapter entitled "New World Order" that there are two basic perceptions of the American ideal: America the Crusader and America the Beacon. He went on to point out that both these schools of thought "envision AS NORMAL a global international order, based on democracy, free commerce and international law", an ideal which in his view has never before existed. Thus our involvement in this region comes almost by default, and with little choice given to the American public. As Bill Clinton unilaterally invaded Serbia and Somalia, Bush unilaterally invaded Afghanistan and Iraq, today Obama, the Nobel laureate prepares to invade Libya. 1. Just as in 1801 this revolution gives the U.S. and its western allies an opportunity to replace a confrontational government with a more possibly more "co-operative" one (although history does not bear out they will "thank us" later). 2. Injecting ourselves into this fluid conflict also helps America to influence the rise of other regional governments , some of which have been long term allies such as: Tunisia, Egypt, Yemen, Oman, Saudi Arabia, and possibly even Iran. In addition Libya, is the northern gateway to Africa's vast sub-Saharan oil reserves, and is in a vital geographic location as it connects with Sudan, Egypt, Chad, Niger, Algeria and Tunis, all countries in political turmoil. 3. By ensuring the fall of the Qaddafi regime, he and his supporters will essentially become renegades in their own country, thus their assets will default to the next government, this includes its vast refining and oil reserves, telecom and state operated industries. Qaddafi himself will likely meet a end similar to Saddam Hussein. 4. While not vital to the U.S. economy, Libya the worlds 18th largest oil producer provides a great deal of resources to multiple NATO countries, and the world oil market, thus America has a stake in the regions continued production as West combats a severe economic recession. 5. If special forces are able to overthrow the regime as effectively as the Taliban in 2003, it would be a political coup for the administration at a moment in which they seem to be militarily bogged down. Ideally any American military involvement will be: small, dynamic, and effective. Each of these points has vast repercussions which will reverberate throughout the world, particularly in respect to the cost of oil, increased conflict, and the cost to the American taxpayer. Recent reports from Libya indicate that the Qaddafi regime have killed thousands of civilians in an attempt to prevent their ouster. While these headlines are alarming they are norms in the region. While America has done nothing to discourage abuses by its Saudi allies it cries foul in Libya, the contradictions are blatant and alarming. Much in the way of his contemporary Saddam Hussein, Qaddafi has vowed to fight to the end as he has absolutely no incentive to give up. Once dubbed " the mad dog of the Middle East" by Ronald Regan, Qaddafi has spent decades solidifying his grip on the region by placing the controls of the country into the hands of his family members. Led by Western educated, but fiery second son, Saif al Islam have also declared (much like Uday and Qussay Hussein in Iraq 2003) that they will never accept the terms of the people's revolution. In addition he asserts that agents of the US and EU are already operating in their territory. While these claims cannot be substantiated at this point, recent reports leave little doubt that once again: AMERICA IS AT WAR. History repeats itself, and all too soon (recent examples of wars that never happened include: Nicaragua, Haiti, Cuba, Laos, and Afghanistan pt.1, and Vietnam, to name a few). Once again STABILITY goes a long way in global politics, and U.S. taxpayer dollars foot the bill. With many options on the table the Obama administration has been largely aloof in the public, not withstanding the standard warning to "refrain from violence" and "crimes against civilians" the administrations signals are largely mixed and seemingly ad hoc. While it cannot be verified as to whether or not U.S. forces are operating on Libyan soil, several warships have been sent to the region to assist with "humanitarian aid" and possible action against the regime itself. As warships are made for one thing, little doubt remains that if the military is not already there, boots will be on the ground within days, if not hours. If Qaddafi gave up today the U.S. military would probably still invade. With a host of global organizations lined up and beating the war drums the UN, EU and WTO have also threatened actions up to and including designating no-fly zones, freezing Libyan assets abroad, travel bans, an arms embargo, the entry of international observers and referral to the International Criminal Court. Sounds like Iraq all over again. While world leaders rattle their sabers Qaddafi has embarked on a campaign of terror seeking to stifle the revolution with little success. "Clearly one in five young people is unemployed. And in some places, the percentage is far more. While some countries have made great strides in governance, in many others people have grown tired of corrupt institutions and a stagnant political order. They are demanding reform to make their governments more effective, more responsive, and more open. And all this is taking place against a backdrop of depleting resources: water tables are dropping, oil reserves are running out, and too few countries have adopted long-term plans for addressing these problems". Her ominous words underline the rationale behind the past 4 decades of U.S. OIL POLITICS. The chilling implication is that America too is caught in this struggle to control the chaos of a changing world as "all this is taking place against a backdrop of depleting resources". Once again two hundred years into the future we find a similar picture: laden with debt, plagued by economic turmoil and entangled in multiple wars our leaders have left us with no choice, asserting that we must police the world and build the nations of others, while ours falls into decline. As our Marines are lined up to march "to the shores of Tripoli" one is left with a sick feeling, almost in awe. American jobs have long since disappeared overseas and our industry is stagnant, but one thing remains the same: we are trapped in a nation governed by the politics of oil.